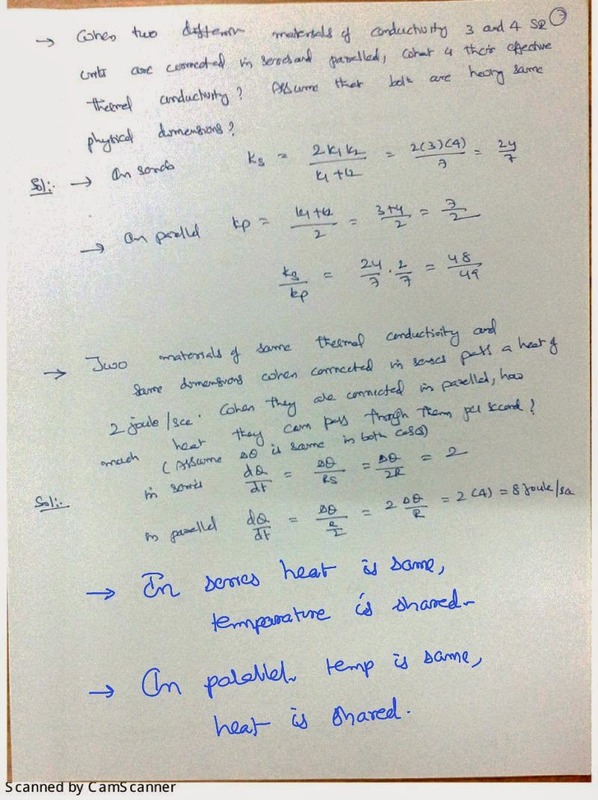 The rate of flow of heat energy through a given solid material is directly proportional to temperature difference between the two ends of the rod. The rate of flow of the heat is inversely proportional to the combination of length area and coefficient of thermal conductivity as shown. Thermal resistance can be defined as the ratio of length of the material to the coefficient of thermal conductivity and the area of cross-section. Thermal resistance is a measure of opposition to the flow of heat. More the thermal resistance it becomes difficult for the heat energy to flow from one place to another place. Thermal resistance is similar to electric resistance. When different materials are connected with different coefficients of thermal conductivity, we can calculate the effective coefficient of thermal conductivity. When the rods are connected in series the same rate of flow happens through both the parts. But the temperature difference in the different junctions is going to be different because of the receiving of different heat energy. The temperature difference between the first and the last end is equal to the sum of temperature difference between the junctions as shown. 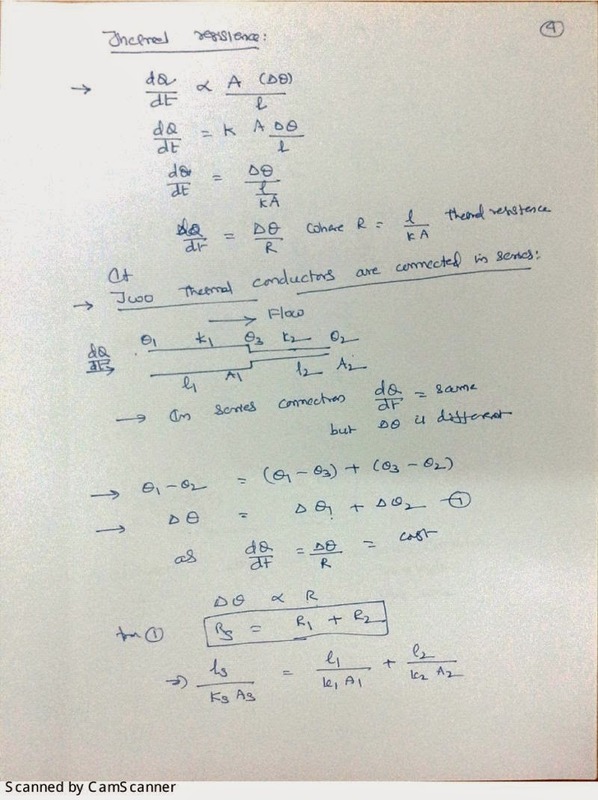 The effective thermal resistance when the 2 rods are connected in series is equal to the sum of the individual thermal resistances. 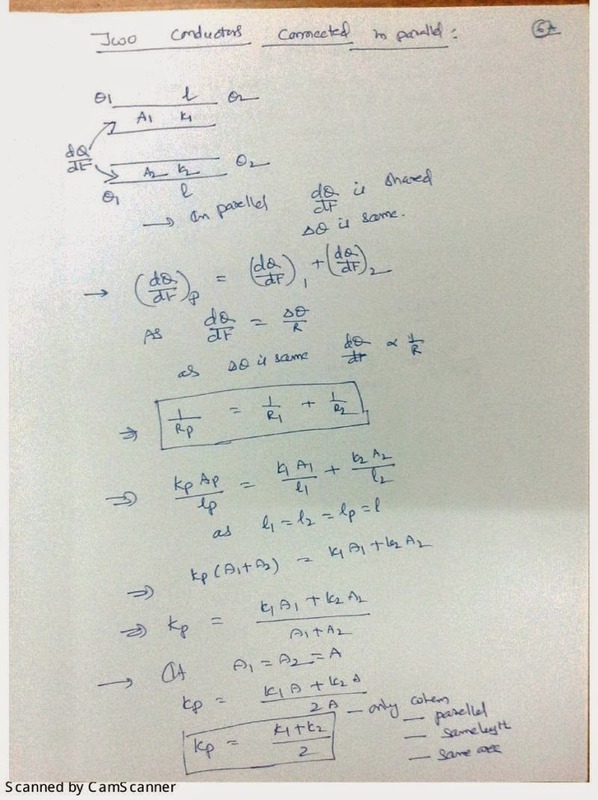 When the two materials are connected in series are having the same physical dimensions, we can derive a simple equation for the effective coefficient of thermal conductivity as shown below. When different materials are connected in parallel the total available heat energy per second will be shared across both of them. Anyway the temperature at the end is going to be the same. The effect to thermal resistance when the rods are connected is similar to the electric resistance when the rods are connected in parallel. 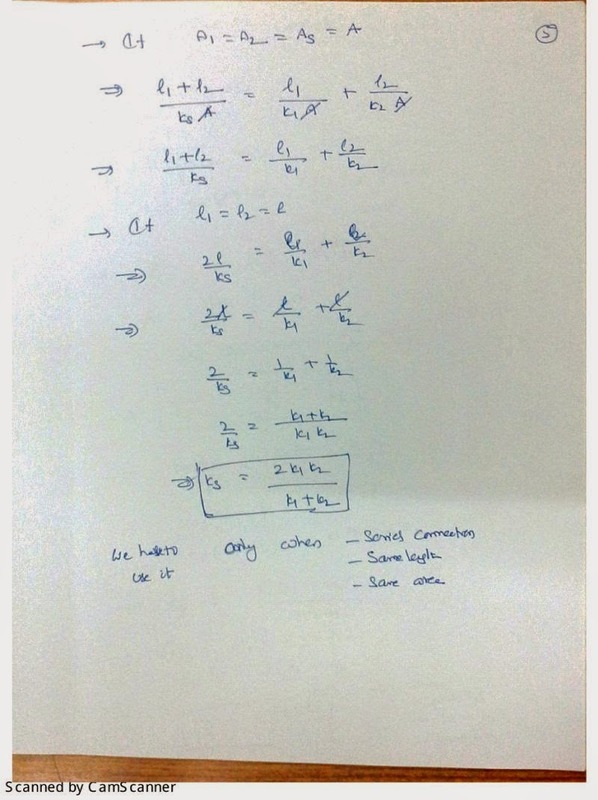 When the two different rods are having same length and same area of cross-section we can derive a simple equation for the effect to coefficient of thermal conductivity as shown below. The solid material having the coefficient of thermal conductivity of 50 SI units is having a length of 1 m and area of cross-section of 5 cm Squire. One end of the rod is placed in the ice and other end is in the steam. How much ice melts in five minutes? We know that rate of flow of heat can be expressed in terms of coefficient of thermal conductivity as per the definition. Latent heat is defined as the amount of the heat energy required to convert unit mass of substance from one state to another state at constant temperature. We can equate the rate of flow of heat energy to read of energy required to convert the total mass of substance from one state to another. By equating both the energies we can get the answer as shown below. When two different metals of coefficient of thermal conductivity three and four SI units are connected in series and parallel what is the ratio of their effect to coefficient of thermal conductivity? Assume that both are having similar physical dimensions. We know that effect to coefficient of thermal conductivity value both the series combination as well as the parallel combination. They were derived in the previous post. We can use those formulas to solve this problem. There is another problem on the same page. Two materials of same thermal conductivity and same dimensions are connected in series pass heat of two joule’s per second. When they are connected in parallel how much heat we can pass per second? We can solve this problem using the concept of resistance. We know that when the rods are connected in series effective resistance increases and when they are connected in parallel effective resistance decreases. 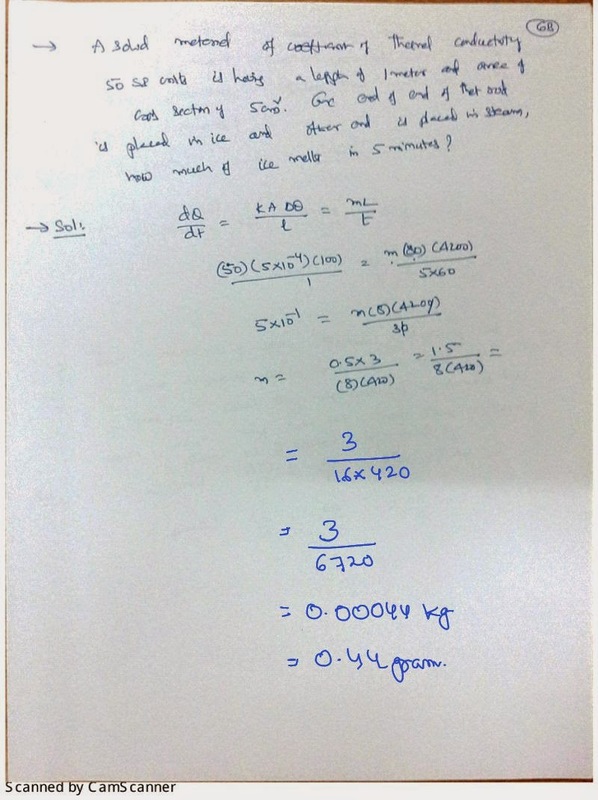 Using their corresponding formula which is derived in the previous lessons we can substitute and get the required answer.